Military intelligence specialist Corporal Kaitlyn Amador is the first woman in the Marines to be assigned to a recon team. And everyone’s watching her. Her mission? Not only prove herself worthy of her place in the group, but uncover the mystery of why Bravo Team is so successful. A mission that gets more difficult every time she’s near Jax. Ms. Long has combined the best of my favorite genres into one astounding book and I can’t get enough! 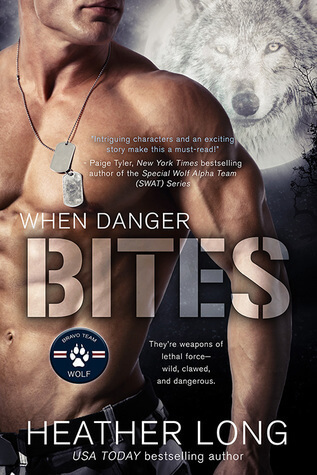 Wolf shifters and military special operators, all the action and suspense, really kickass characters, a very exciting plot, what more could a girl ask for? Captain Jax Raymond’s Bravo Team WOLF is the best of the best, with good reason. It’s completely made up of wolf shifters and their military skill complements their paranormal abilities. Their assignments are classified at the highest levels and very few people know their secret, but their success rate and low number of casualties have been noticed. Enter intelligence analyst, Corporal Kaitlyn Amador. The first female Marine try out to join the team, she has orders to infiltrate the team and uncover the secrets behind the team’s extraordinary success. As distasteful as her assignment is, Kat is a Marine through and through and orders are orders. Having Kat on their team is a double threat to them. As a human, they can’t let her find out their secret and as a woman, Jax and his wolf are irresistibly drawn to her and with every passing day, it gets harder to stay away from her. Even though he has orders to wash her out, he is rooting for her to succeed even though it could put the entire team at risk. But Kat doesn’t know how to quit and pushes herself every step of the way, excelling at every task and earning the respect of the entire team. The first book in a series can make or break it and this book has me eagerly anticipating the rest of the series! I enjoyed it because while Ms. Long laid the foundation for more to come, the entire story revolved around the main characters. The attention to every detail, even the most mundane, brought the story to life and the buildup of passion and suspense was worth the wait it took to finally get to the climax. Jax and Kat’s struggle with duty and doing the right thing, and even the impact of a relationship between them on their careers meshed very well with the rest of the story. Jax was everything you expect a team and pack leader to be – dominant, fair and commanded the respect of his men, but the vulnerability he exhibited with Kat, the conflicting urges to protect her and respect her skills endeared him to me. However, Kat stole the entire show in this story. She was formidable, smart, skilled and very much a match for Jax and his wolf. As a human among shifters, she kept up well with them and was an asset to the team in many ways. I also enjoyed the camaraderie among the wolves and the cohesion within the team. I really hope that the rest of the team each gets a book because I would love this series to continue. If you have enjoyed Paige Tyler’s shifter series, then this is another you definitely will enjoy!